Detectives investigating the identity of a man after his body fell from the undercarriage of an incoming flight to Heathrow airport now believe he is from Mozambique. Officers originally thought the man was Angolan but following analysis of a sim card found in the man's jeans they were able to extract telephone numbers stored on it. After contacting the numbers, officers received information that the man was from Mozambique and are now re-appearing for anyone with information to come forward. It was thought he was from Angola as he was found with Angolan currency in his possession and enquiries established that a flight from Luanda, Angola was overhead prior to the body being found. Police were called at approx. 07:55hrs on Sunday 9 September to Portman Avenue, Mortlake, following reports of a dead body. London Ambulance Service attended and the man was pronounced dead at the scene. He was not a member of air crew or a passenger. Although officers believe they now know the identity of the man, they await confirmation from next of kin. Offices are still working on the principle that the man flew in from Angola. S ubstantial enquiries have failed to identify the man and officers are releasing two images in order to unravel the mystery around his identity. This picture is of a tattoo from his left arm. 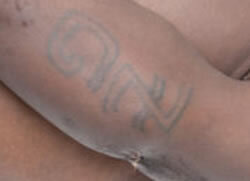 The tattoo is a very distinctive emblem with the letters ' Z ' and 'G ' clearly visible (pictured left). A post-mortem was held at Kingston Hospital Mortuary on 11 September and gave the cause of death as multiple injuries. An Inquest has opened and adjourned at West London Coroners Court. 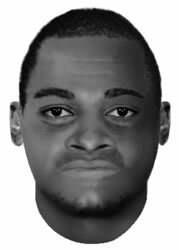 Officers are keen to identify the man so that next of kin can be informed. A post-mortem examination was held at Kingston Hospital Mortuary on 11 September and gave the cause of death as multiple injuries. An Inquest has opened and adjourned at West London Coroners Court. Anyone with information that can assist is asked to call officers on 020 8247 7202; if you wish to remain anonymous call Crimestoppers on 0800 555 111.